This terrific booklet will show you 101 spectacular magic tricks using one of the most ingenious magical tools, The Svengali Deck. Don't limit your use of this fabulous deck to one or two effects. 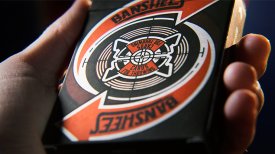 With this booklet, you can learn to use the special secret of the Svengali Deck to perform incredible feats. Learn such effects as: Mindreading, Bigger and Better, The Svengali Tap, The Svengali Scramble, The Telepathic Tattle, Bottom's Up, Good Vibrations and many, many more! You can look like a professional sleight-of-hand artist in just a few short moments. This is the perfect companion to Royal Magic's Svengali Deck!